Fruit is composed of mostly water and sugar – it’s the heat of grilling that reduces the water, concentrates the natural sugars and creates the divine sweetness of caramelization. These natural sugars, however, can burn quickly, so it’s important to watch fruit closely on the grill. When choosing fruit for grilling, select firm, but ripe pieces. Firmly textured fruits such as apples and pears tend to retain their structure for grilling. Softer fruits like plums, nectarines, melons and bananas – even grapes on their stem – will soften quickly. Leave the fruit unpeeled to help it retain its shape while grilling. Most fruit can simply be washed, halved and pitted or cored. If you want to grill sliced fruit, it helps to use a hinged grill basket, perforated barbecue topper or place a sheet of nonstick aluminum foil directly on the grill. Fruit may also be threaded on bamboo skewers for kabobs to serve with a dipping sauce. Before grilling, be sure the grate is scrubbed clean – all leftover grilling residue and drippings should be removed to ensure the best fruit flavor. When ready to grill, it helps to lightly brush fruit with a mild cooking oil or melted butter. Grill fruit over medium direct heat just until fruit softens and browns slightly, turning once halfway through cooking. For a sugary-crisp coating, sprinkle brown or granulated sugar on the cut side of the fruit; let stand 10 minutes to allow the sugar to dissolve; grill fruit, cut side down, several minutes. If using a glaze, brush on fruit near the end of the cooking and watch carefully since the sugars can burn quickly. 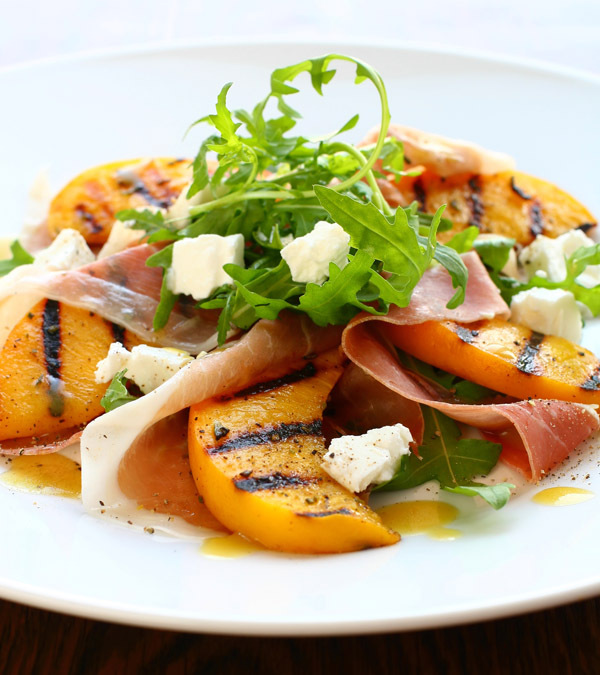 Sliced pineapple and halved stone fruit such as peaches, nectarines, plums, pluots and apricots are perfect candidates for grilling, but branch out and try some unexpected fruit on the grill. Cut unpeeled mango lengthwise along the seed, then grill, cut side down. Scoop fruit from peel to serve. Cook peeled bananas or a small bunch of seedless grapes on their stems directly on the grill and cook just until they soften slightly, about four to five minutes. Sliced honeydew and cantaloupe melons are also great options for the grill. They can be cooked with or without their rind intact.